Dianne Peterson holds a sign criticizing county executive Rich Fitzgerald’s positions on environmental matters at a Fridays with Fitzgerald protest held at the Allegheny County Courthouse. Dianne Peterson lives and breathes air quality. Whether she’s taking her dog for a walk, gardening around her home or watching her son play soccer outside, the air quality often leaves the O’Hara Township woman wondering if stepping outside is even worth it. 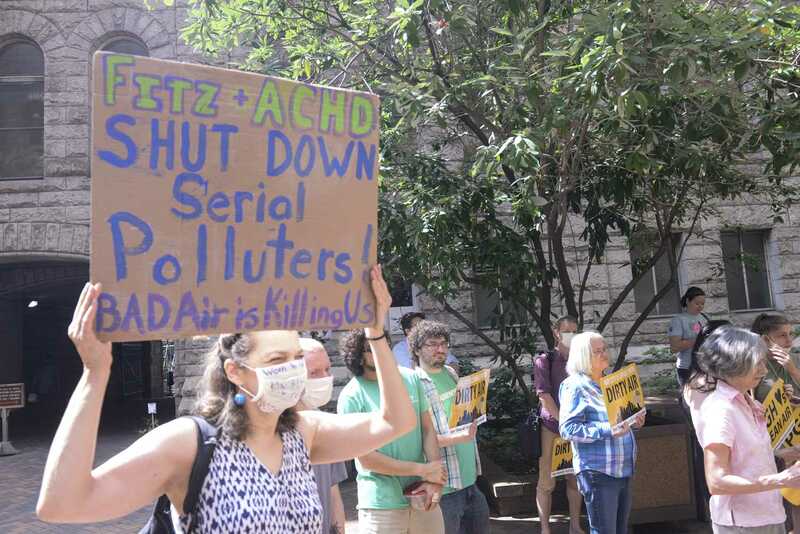 Peterson, along with about 20 other Pittsburghers, arrived carrying signs to the Allegheny County Courthouse Friday for Fridays with Fitzgerald — a weekly rally for clean air in Allegheny County. Allegheny County Clean Air sponsored the event, along with the Breathe Project, GASP, Clear Air Council and PennEnvironment. Ashleigh Deemer, the Western Pennsylvania director of PennEnvironment, spoke at Friday’s rally along with District 34 Democratic nominee Summer Lee. Those attending rallied for County Executive Rich Fitzgerald’s attention and to encourage him to take a stand against major polluters in the county. According to the American Lung Association’s 2018 “State of the Air” study, Pittsburgh is ranked 10th out of the 25 U.S. cities most polluted by short-term particle pollution. Allegheny County is also in the top two percent for cancer risk from air pollution in the country — a problem that, according to Peterson, the county can remedy. Deemer cited Pittsburgh pollution giants as a main cause of the bad-air epidemic, naming Clairton Coke Works as a prime offender, which this summer was fined over $1 million for it violating pollution laws. Deemer noted the effects pollution has on school children in the county, saying some schools experience twice the rate of asthma of other schools in Pennsylvania and the country — and said that they will continue to hold clean air rallies for “vulnerable people, older folks and kids” until the county decides to hold these polluters accountable for their actions. Though Deemer still sees room for improvement in Allegheny air, she acknowledges the Allegheny County Health Department is working to help citizens breathe easier. The department has demanded that Clairton Coke Works pay for their damage to air quality, and they’ve also spent money and resources on educating the community about air pollution issues and public health, as well as promoting clean air projects. Lee called on politicians as another avenue for change in air quality. Though admitting environmentalism wasn’t an issue at the forefront of her mind before her campaign, Lee now sees clean water and air as inherently political issues. Though Fitzgerald hasn’t made any appearances at the clear air rallies, Deemer says they have communication with the county executive as they work to elevate the voices of Pittsburghers who are fed up with the current climate. Deemer and other rally organizers recognize going up against major pollution contributors like the coke plant is a tough task, and want to do all they can to support efforts by Fitzgerald and the health department while making it clear that the clean air council has no plans of backing down from its own clean air initiatives. Deemer didn’t say when the next Friday with Fitzgerald will be, but said that ralliers will continue to meet until Allegheny County has clean air — and, as Peterson hopes, bring awareness to the cause. Jon Kunitsky contributed reporting for this story. Correction: Ashleigh Deemer cited Clairton Coke Works, not DTE Energy’s Shenango coke plant, as a contributor to Pittsburgh’s pollution. Clairton Coke Works was also incorrectly called Pitt coke works in this story. This story has been updated.